Littonia modesta is a climbing Lily with golden orange flowers, perhaps not as spectacular as its close relative the gloriosa however it is still an elegant addition to the garden and is easier to grow than the gloriosa. Nice foliage leaves with tendrils that support its climbing habit. Golden yellow bell-shaped flowers in early summer. 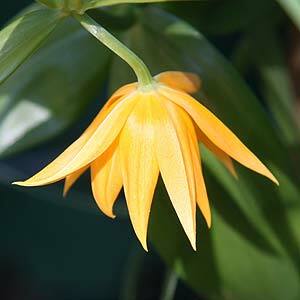 From South Africa this bulb prefers part shade, and needs something that its tendrils can use as support as it climbs upwards. A hardy bulb that only requires dividing every 4-5 years, unless you have a very wet winter and poorly drained soil, in this case in will need to be lifted. Large seeds form after the flowers and can be sown in pots, they are a slow germinating seed, so be patient.